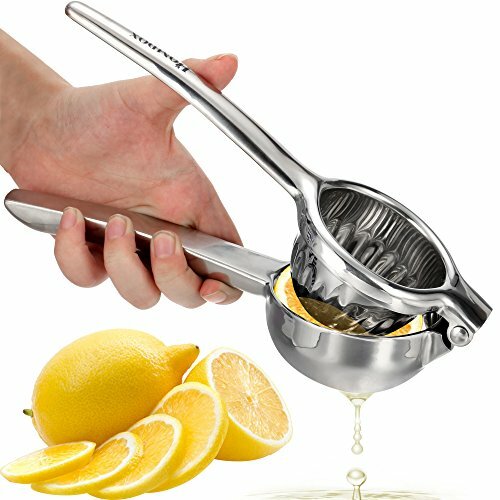 Why Choose our Lemon Squeezer? - Food-Safe 18/10 Stainless Steel: The Stainless Steel Lemon Press is made of the same high quality alloy as eating utensils, and won't rust, scratch, pit or crack. It won't leach toxins into your food like plastic and aluminum can do. - Designed to Get MAXIMUM Leverage From the Two Handles, So You Can Extract Almost Every Drop of Juice. - Can Be Used for Lemonade, Cocktails, Fish, Salad and Much More. - Unlike Others Chipper Squeezers That are Breaking After a Few Uses, Our Squeezer is Made to Last by specil and Will Remain in 100% Perfect Condition All the Way. - Easy to Use For both kids and old men AND for Both Amateurs and Professionals. - Dishwasher Safe and Super Easy to Clean. - If for any reason you're not completely satisfied, return your Lemon Press for a No Questions Asked Full Refund. ✔ Excellent addition to any Bar to add that special touch to your beverages. ✔ Ideal gift for the gourmet chef or someone that just enjoys cooking. Before cutting the lemon in half, roll the lemon around on the counter top with some good pressure, almost like you are giving a back massage. This will help breakdown some of the internal membranes and allow the lemon juice to escape easier. We hold a single goal in mind: to make the smart life easier and advocate environmental protection. That means starting with affordable, high-quality gear and ending with a commitment to 100% user satisfaction.